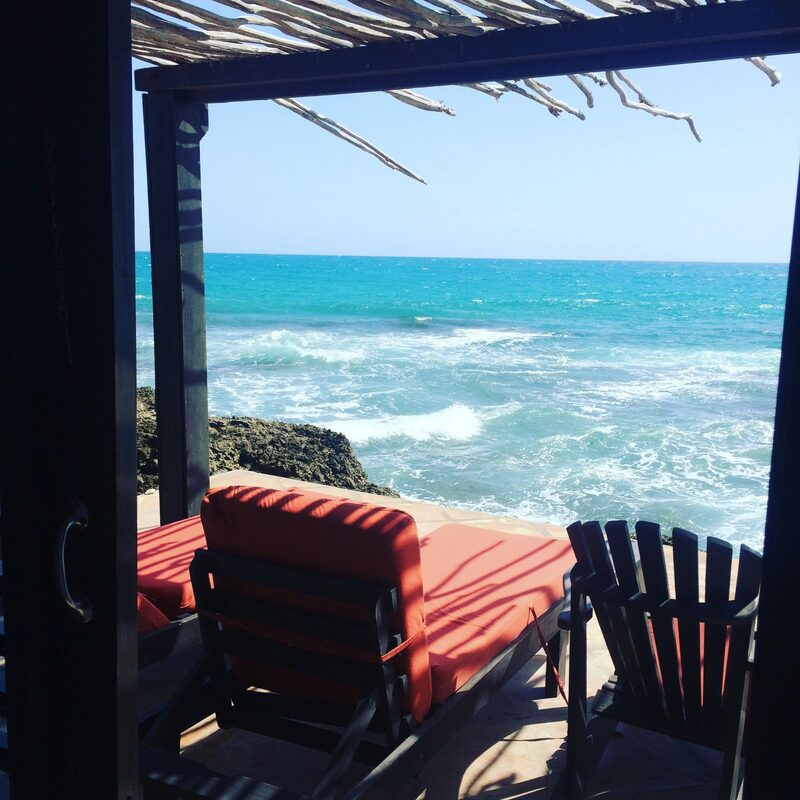 Chef Jamie Bissonnette's picks for where to stay, eat and drink in Treasure Beach, Jamaica. Chef Jamie Bissonnette is the co-chef and owner, along with Ken Oringer, of Coppa, in Boston and New York, and Boston locations of Toro. He published his first book, The New Charcuterie Cookbook, last year. I went to Jamaica because I needed to unplug and I wanted to go somewhere I hadn’t been before. I was talking to my girlfriend about somewhere that was relaxing and wouldn’t have a lot of tourists, and she knew of this place in Jamaica called Jake’s. It’s in an area called Treasure Beach, which is two and a half hours south of Montego Bay. Jake’s isn’t really a resort, but it’s kind of a resort. 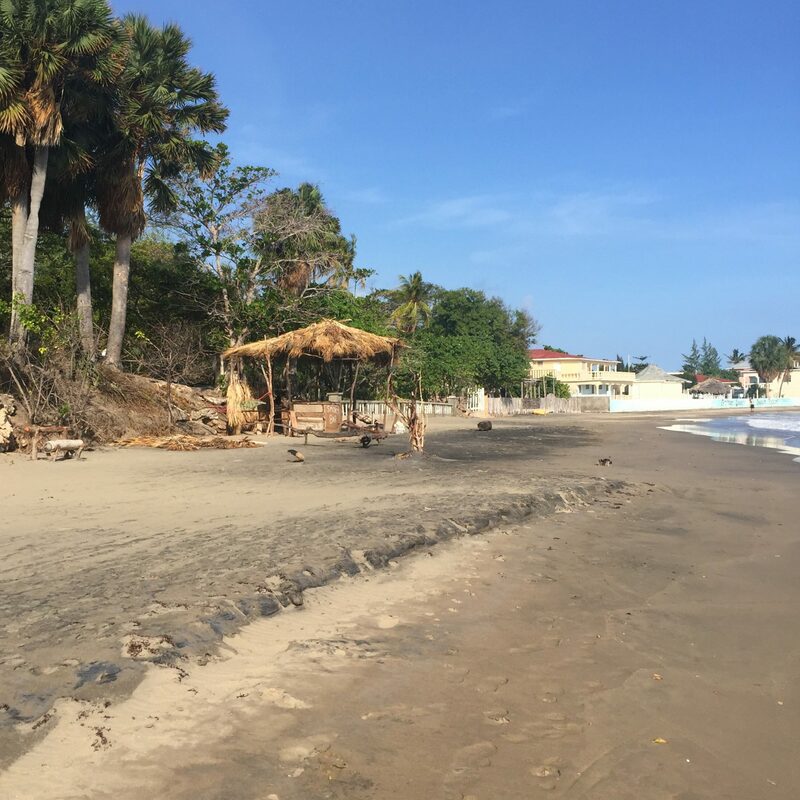 It’s not a froufrou place—it has a house where you check in, there’s a restaurant there, there’s a saltwater filtered pool and all of these villas and houses that you can rent like a hotel room. The closest city is Black River, which we drove through on the way in and out. It’s about 45 minutes away. The whole area reminded me of Truro and Provincetown on the Cape. I definitely recommend bringing a few books and a deck of cards and just planning to chill. We played a lot of gin rummy. Not only did we stay here, but we ate here more than anywhere else. The chef was awesome. The menu changed every single day. 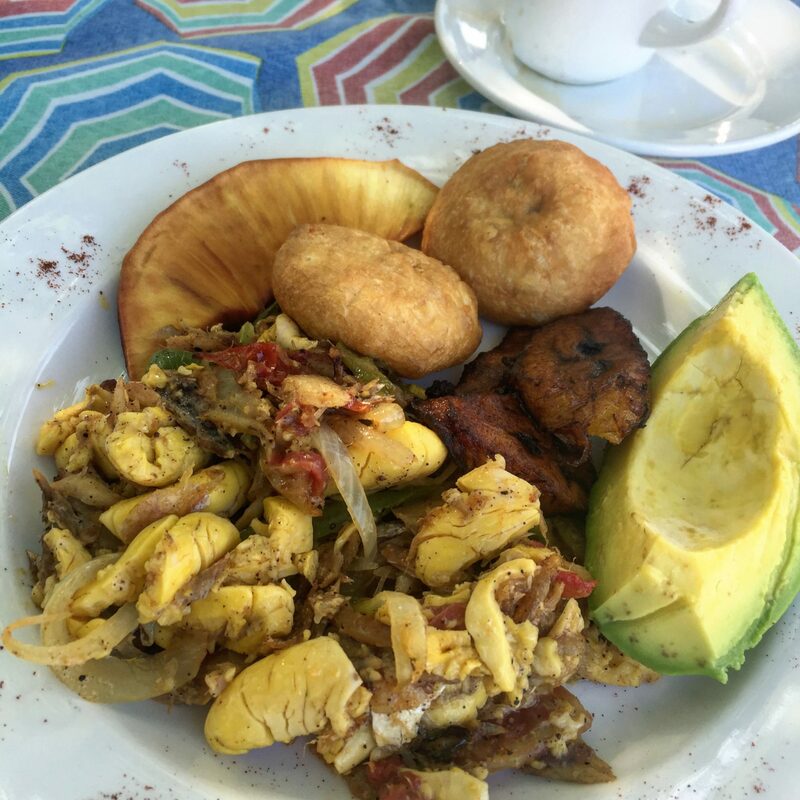 We had salt cod and ackee for breakfast. Ackee has the texture of curdled scrambled eggs, but it’s a fruit. We had lots of fried breadfruit and slow-cooked sweet plantains, too. They made these dumplings with cassava that were really dense, so you thought there was no way they could be good; the way they looked kind of reminded me of a bad hush puppy. They came with mackerel run down, which is braised mackerel. They call it "run down" because they cook it so it reduces and runs down from being thin to thick. It has fresh coconut and lots of turmeric and curry and lots of peppers and allspice and thyme. There’s coconut oil dripping off the pile of mackerel run down, so you dip the cassava dumplings in it. It was awesome! Perfect textural combination. One night I had amazing jerk lobster—it’s lobster out of the shell, chopped up and cooked with the jerk sauce with lots of black pepper and chiles. It reminded me of getting black pepper beef or shrimp in Chinatown. It had a lot of the same sensory memory as I was eating it. And it came with rice cooked with coconut milk and pineapple. All of their pineapples were the size of a softball, wicked tiny and really orange. So sweet. Everyone was like, "You should go to this place Eggy’s." It was on the beach and had been washed away by a storm a couple of weeks earlier, so the owner had a new place called Smokey’s. And I could have built the thing. I mean, it was this little shack, barely, and he had a boom box transistor radio thing going playing some dub reggae. It was their second day being open. They were sitting out there and they had a couple of cases of beer, some soda, some local ginger beer. They were like, “We’re having our big kickoff tonight. We're having a bonfire and music and dancing.” Beers were really cheap, like $2.25 for a Red Stripe. People told us about this guy Delvin who does a pop-up jerk restaurant. 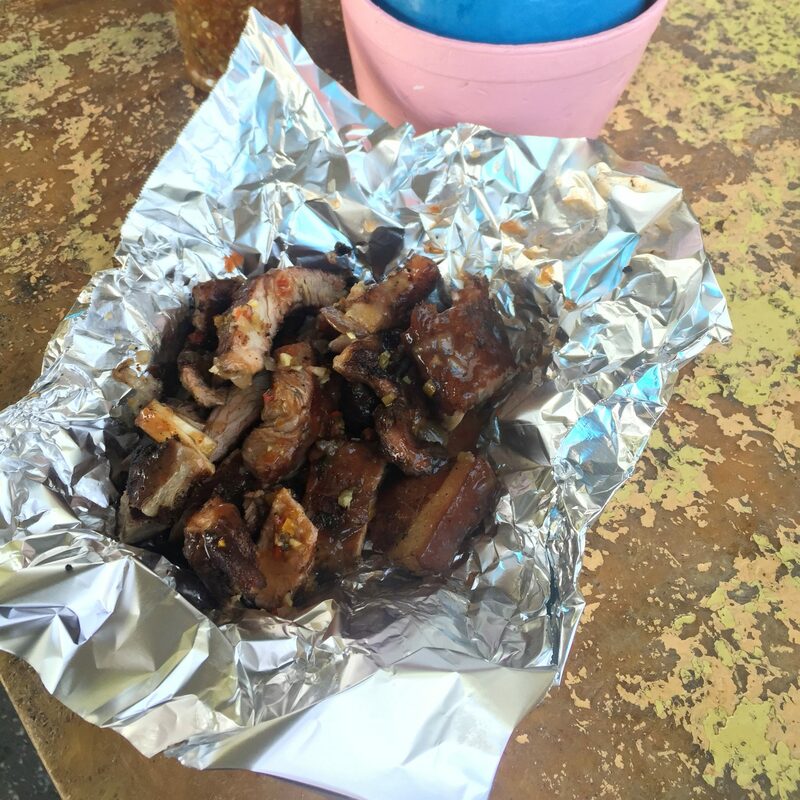 It was street meat Jamaican-style—pork and chicken jerk in the parking lot of a little convenience store only on Saturdays. I’m waiting in line with the captain that takes you out to the Pelican Bar by boat and a couple of cops and a couple of rastas. They’re all like, “Try the chicken, try the pork. Try it with the hot sauce. Try the roti." Sharing theirs with me. They were excited that people are interested in their food. They understood that you don’t find this part of Jamaica by just searching for somewhere to go. It’s not an all-inclusive, party place. The bars close at like nine. You go to the road that Jake’s is on and Delvin's is next to the church. You ask people the name of the road and they’re like, "This is the road that Jake’s is on." 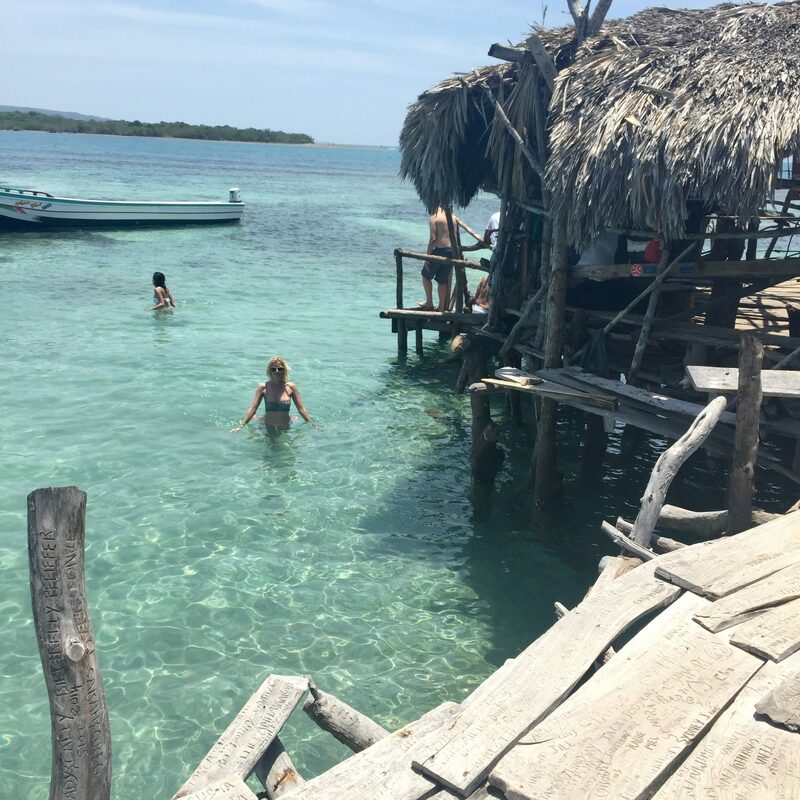 We chartered a boat to go out to Pelican Bar. It’s like a 45-minute ride over the open sea with a little motor on the back. The ride out was really smooth; the ride back was superchoppy, like a carnival ride. I loved it. It’s like a mile offshore and you come up to this sand bar, so the water’s like two to three feet deep and really warm. There was lots of coral that you couldn’t walk on and a bar right in the middle. It got wiped out in a hurricane once and so Jason, and basically the whole town, helped him rebuild it. As soon as you get there, they say, “Do you want to eat or not?” There aren’t options. You get steamed rice and local flat fish that kind of looked like flat mackerel. There’s an old wok set up like converters for a range, which they stuffed with wood then lit a fire. You’re on this little rinky petrified wood and dried leaf thatched roof thing in the middle of nowhere and I’m like, you’re starting a fire in here intentionally? When the fish is cooked, they put a sweet-spicy scotch bonnet chile sauce on it and fresh herbs. We were going to go to Smurfs, but on the way we passed Paddys. A lot of the restaurants and bars in the area look like a one-bedroom house where the living area and front porch are turned into a restaurant. It was like 7:00 a.m. and it was really hot, and I had a sunburn and didn’t want to walk in the sun for another ten minutes to get to Smurfs, even though everyone said it’s great. We had pancakes and ackee and salt fish. He makes the pancake batter to order. There’s so much cane around there that they use to make rum for Appleton, so they have really good cane sugar. He whipped up coconut flour, cassava and flour to make these little silver dollar pancakes. They were crispy and chewy. There isn’t good maple syrup, but the butter is so orange and really flavorful. It reminds me of Quaker butter. When you leave Jake’s, take a left and walk for three minutes and you’re at Paddys. Jake’s owns the property across the street now where they have a hostel called Jack’s. They had a bar with pizza, seafood and beer. It reminded me of an old-school pizzeria in New England—with a couple of tables, a video game, jukebox. It’s like a pizzeria diner. Except they had an awesome old-school jukebox that played 45s with lots of ska, reggae and dancehall music. It was a cool place to hang out. They had everything from jerk sausage pizza to sea puss, which is octopus. So we had jerk octopus and jerk chicken wings with french fries.